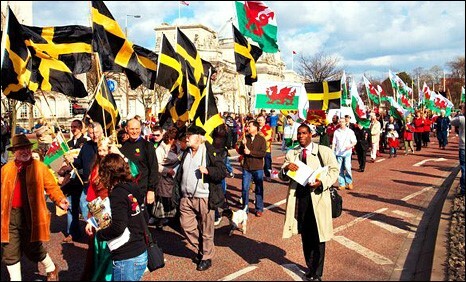 March 1st is St. David’s day, the Welsh equivalent of St. Patrick Day. Unlike the army of green that will descend on our fair city in a few weeks, very few folks will sport red, pin a leak or daffodil to their lapel, and raise a pint to the patron saint of Wales. What little we know of David might have us to putting down the pint, setting aside the Welsh Cawl soup, and reaching for a stale piece of bread and some devout meditation. Sixth century Celtic holy men tended to favor the ascetic existence. Living and preaching in the remote, wilder parts of Britain they would even go so are as to drag their own plows rather than using animals. If you go to Wales and visit these holy sites you can certainly appreciate the commitment of these early disciples. Since travel by road was tricky in the 500’s, much of the gospel was spread via boat to the coastal areas of Britain and Ireland. Here you find the most extraordinary sites which became chapels, monasteries and cathedrals such at St. David’s own located on the coast of North Pembrokeshire. From the desserts of the middle east to the sea blown green pastures of Wales came the word of the Gospel that would inspire the Welsh Princess to beat back the Saxon hoard for another 500 years. So it was in 1974 when Jon Dressel, recently converted to his ancestral roots, brought the first Welsh Pub to St. Louis at the corner of Euclid and Mcpherson. It’s not apparent these days what made that pub so special but in its heyday the shotgun tavern was a unique blend of the O’Connel’s Gaslight Square tradition meets Welsh Pub. One cook, one bartender, two servers and a whole lot of fun doing the midnight Anvil chorus on a Saturday night. After living in Wales for a good stint (and selling their shares in Llywelyn’s to partner Jack Brangle) the Dressel’s opened their second Welsh Inspired Pub. Perhaps the original Dressel’s was known more as a tavern celebrating the arts than a Welsh pub but over the years the Welsh art and Welsh beer slowly brought the place back to the Celtic fold. These days the entire dining room is dedicated to things Welsh. Current owner, Ben Dressel, spent a good part of his life living and working in Wales so it seems fitting and legitimate to celebrate Wales within the ancient walls of Dressel’s. This weekend there will be Daffodils on the tables, Welsh Cawl in the Stockpot, Civil Life Angle & Sword Bitter Ale on tap and plenty of “Hwyl” for those who wish to take a break from pious life to spend a little time in the tavern.